Why? Because like good silverware it is made of STAINLESS STEEL and the curved cleaning edge removes bacteria and soft plaque in seconds! 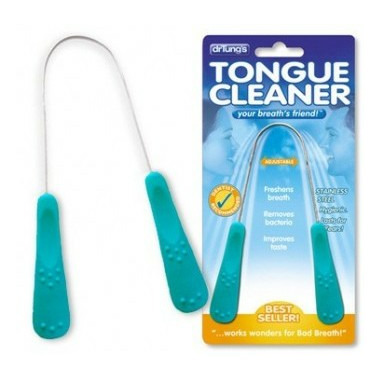 Cleaning your tongue is comfortable, quick and effective with Dr. Tung's. GUARANTEED! Dr. Tung's uses stainless steel because it is impervious to bacteria, is more comfortable and gentle on the tongue than plastic. This is why people prefer eating with silverware than with plastic ware. Used and recommended by dentists and hygienists, Dr. Tung's cleaner is the leading tongue cleaner in the health market and is sold in health stores and dental offices around the country. Surprise! The Dr Tungâ€™s tongue cleaner arrive with a little bag for trip. Great! Tongue cleaning really is the grossest thing, but man does this little tool do the trick. Exactly what I wanted. I wouldnâ€™t have chosen pink but the handle colour really doesnâ€™t matter. As others mentioned, it comes with a handy carry bag. Super easy to use and clean. Great product and it comes with a convenient carry bag! i find this one hard to clean my tongue even when I put a lot of pressure to scrap. The GUM tongue cleaner is like a comb on one side and scraper on the other. I hope this helps. Excellent product. Works well. Comes with convenient carry case. Good price point. Recommend. Works super well and can be put into the dishwasher. Great product, that lasts a long time. I had another plastic scrapper but this cleaner is far superior. I love that I don't have to worry about it breaking, the carrying pouch is convenient & discreet & I can get more surface cleaned. Excellent product, before ordering this I used a table spoon and this works much better! Simple to use and effective at removing tongue gunk. My breathe smells noticeably better immediately after using. I've been using it twice a day for a couple weeks now and am very satisfied! Also, fastest shipping I've experienced! It arrived super quickly and works awesome! I love the little travel case it comes with! Super tool, does the job right. I used to brush my tongue, but it doesn't get the job done like this tongue cleaner. Very impressed with Dr. Tung's products. Cleaning your tongue is an important step for fresh breath, but if you're like me, and brushing your tongue makes you gag, then Dr. Tung's Stainless Steel Tongue Cleaner is definitely the tool for you. Easy to use, easy to clean, very comfortable on your tongue. Everyone needs this....you cannot believe what comes off of your tongue even after brushing it! Will never go a day without it! This is the first tongue scraper I have used. I think it works great. The only reason it would make someone gag would be if they placed it too far back too soon. It takes some getting used to. Takes getting used to from brush style but very worth it. Easier to clean, sanitize, and more effective in my experience. I use mine throughout the day when at home. Be careful and gentle until you get used it and be prepared for what you see. I'm buying one for my hubby now. Would be great if company offered a carrying case for it and or a smaller portable version. First tongue cleaner and I love it. It is good quality and very easy to use. A little on the pricy side but because of the quality, it'll probably last awhile anyway. I was very disappointed with the tongue cleaner. It makes me gag to use. So it was not money well spent.